Earning Turbine Points are a simple but time consuming process. It requires patience and dedication. 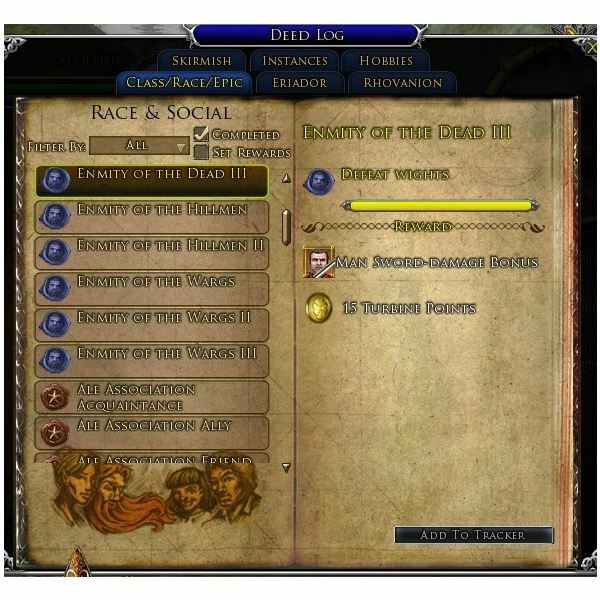 There are a few ways to achieve this and they are all done via deeds.This article will cover the ways to earn turbine points in LOTRO (Lord of the Rings Online). Deeds can be broken up into different types and are specific to a particular zone. For example, a slayer deed in Bree-land can not be advanced by killing stuff in Moria. The types are: Slayer, Exploration, Quest, Class, Racial, and Reputation. Each one requires something different and will award different amounts of Turbine Points. Lets take a look at them. Slayer deeds require you to kill a certain number of enemies and has two levels of advancement. The first level requires a smaller amount of enemies to be killed and will yield you five Turbine Points. The second level, Advanced, requires you to kill double the amount of the first level and will yield you ten Turbine Points. Racial deeds are awarded for killing certain mobs that your race has Enmity toward. These vary with each race and come in three levels except for the final set. The final set will have only two levels. The first level will earn you five Turbine Points, the second will earn you ten and the third will earn you fifteen. Exploration deeds require you to find certain places in an area. These will usually be found while questing but some may require you to do some searching. Completing these will earn you five Turbine Points while some may give you ten Turbine Points. Quest deeds are awarded by completing a certain number of quests in a particular area and has three levels. They require various number of quests to be completed depending on the zone. Completing the first level will give you ten Turbine Points, ten for the second and fifteen for the third. Class deeds take a little while to complete because they can only be increased by so much per day. They require you to use a certain skill, over and over again. Regular class deeds will earn you five Turbine Points, Eriador legendary class deeds will earn you ten and Moria legendary class deeds will earn you twenty Turbine Points. Reputation deeds are earned by doing some quests, turning in certain barter items and by doing certain instances. These can require a lot of work but also offer a good number of Turbine Points. Each one has four levels except Forochel which has five levels but you only gain Turbine Points for four of them. Acquaintance gives you five Turbine Points, ten for Friend, fifteen for Ally and twenty for Kindred. As you can see above, there are quite a few ways of earning Turbine Points. These will usually advance as you quest through an area. I would suggest that you take the time to grind out the Slayer deeds as they are usually one of the longest to complete. In no time, you will see your Turbine Points increase and will be able to buy the items you like from the LOTRO store. A couple guides on how to easily earn turbine points in Lord of the Rings Online.